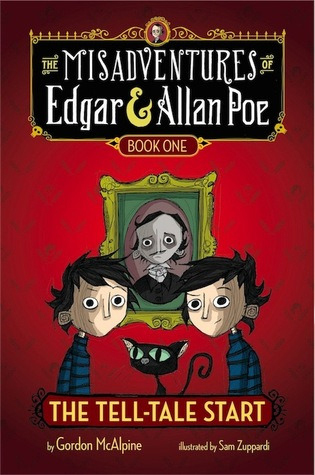 Edgar and Allan Poe are identical twins and great (great-great-great...) grandnephews of Edgar Allan Poe. They are in fact so identical that people have a hard time telling them apart. Even the twins have some trouble determining if they are different people or one in the same. Their cat Roderick goes missing and the twins learn that he's in Kansas at the Dorthy Gale farm. They devise a plan to go rescue their cat, but something about the situation seems a bit suspicious. The boys don't see anything funny, but their is someone watching over them and if they can get his messages, things might just turn out all right. What a fun start to a series. I think these are going to be a big hit. This was a nice quick read with a nice little mystery snuggled in between the covers. The only thing I didn't care for in this book was the Halloween part. It seemed elaborate and didn't really seem to serve a purpose. It could have been removed and given a few more pages for the mystery. The mystery was a bit easy to solve, but it was still interesting because with a mystery you never know if you've actually solved it until the very end. Even at the end there are usually new things that you find out that you couldn't have deduced. I think this will appeal to younger audiences, perhaps reluctant readers. It is a short read and I think kids will enjoy the mischief that the brothers get up to. The science stuff is neat too, but may or may not be appealing to kids depending on what they are into. I look forward to the next installment with the twins. 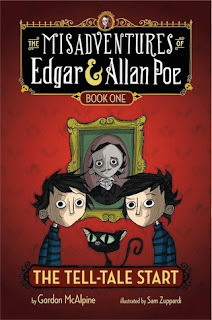 "Edgar and Allan Poe sat beside each other in the back row of their homeroom class, asleep." "The twins looked around the room for whatever wasn't hidden. The problem was the everything they saw wasn't hidden." This looks like a cute MG book, even if the mystery was easy to solve.